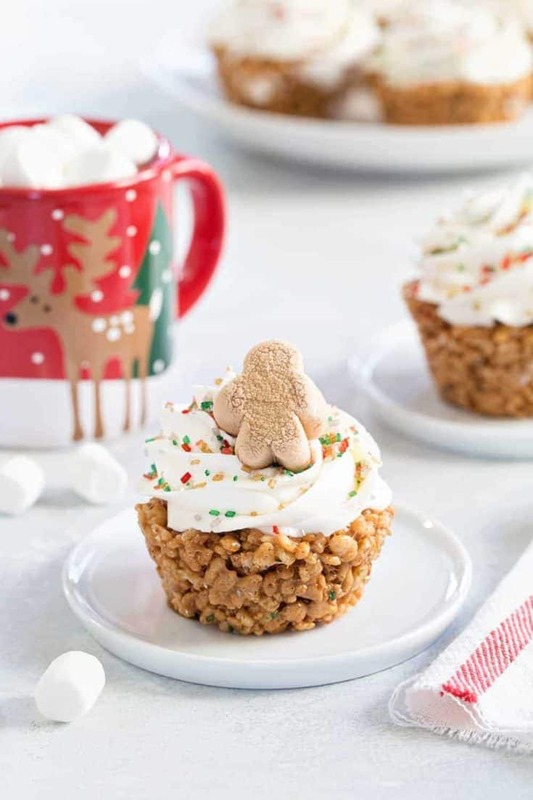 Gingerbread Marshmallow Treat Cupcakes are an adorable and delicious addition to any holiday dessert plate! 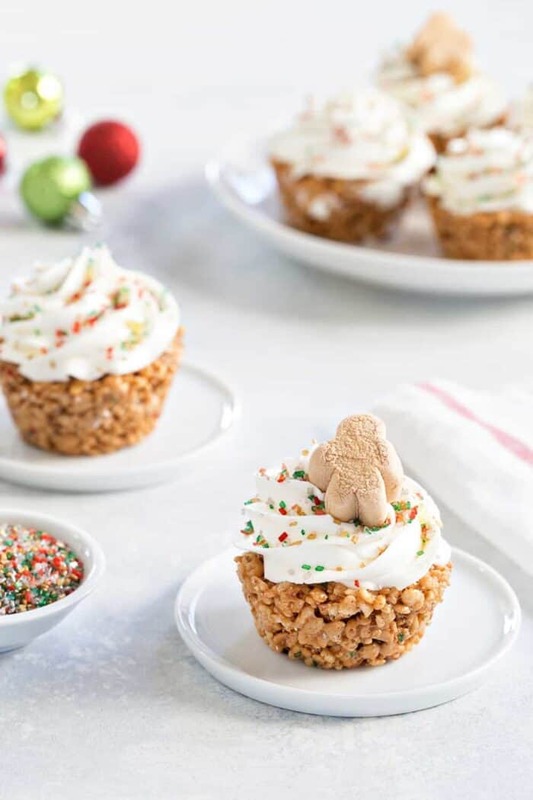 Festive sprinkles and mini gingerbread marshmallows make them extra special. I need you guys to make me feel better about where I stand right now in regards to Christmas – even if you have to lie a little, puhlease. I was so on top on my game at the beginning of November, I was borderline gloating about it. I pretty much had everything purchased for Elle, which by the way was a huge mistake because now she’s not in to that anymore (her words, not mine,) so I have to return about 5 things that will otherwise sit in a box. I also had big plans of wrapping her gifts in coordinating pink paper with festive homemade bows. Now, on the 21st of December, I’m like where are the gift bags? Gimme all the bags. I’m also channeling my inner Oprah because on Christmas Day, I’m just going to pass out everyone’s gift while saying, You get an Echo, you get an Echo and you get an Echo. Because Amazon Prime. I mean, if they had cuter wrapping paper, they’d be doing that too. And if you can believe it, I have not one cookie baked. Heck, I don’t even have cookie dough waiting for me in the freezer. Not to mention my husband just had ACL and meniscus surgery, so he is a legitimate mess and I swear is somehow functioning on like 2 hours of sleep a day. Between running to the grocery store for bags of ice for his nifty icing machine, finishing work deadlines and trying to run a household, I’ve turned into the Grinch. And somehow I need to get my holiday cheer back by tomorrow. Because let me tell you, I have a good 2 days of wrapping and baking ahead of me. I feel like there should be some sort of service for moms like me at this time of year. Maybe a gift wrapping service that also cleans your house AND bakes yummy cookies? That sounds like the stuff my Christmas dreams are made of right now. 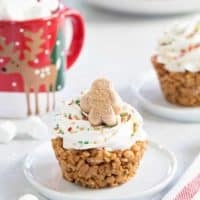 If by chance you’re feeling the stress of the season and need a delicious treat for your office potluck, or Christmas Eve dinner at Aunt Betty’s, I’ve got you covered with these super simple Gingerbread Marshmallow Treat Cupcakes. Not only do they come together in less than 15 minutes, they’re also super adorable and festive. 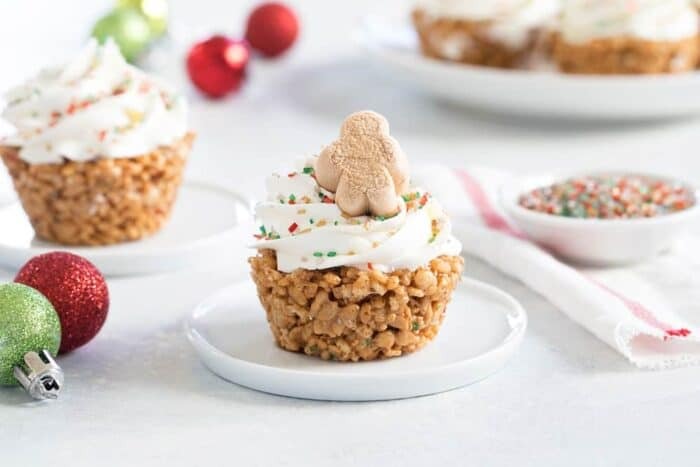 Who could possibly resist an ooey-gooey gingerbread flavored marshmallow treat in cupcake form topped with sprinkles and cute marshmallow gingerbread men? Speaking of sprinkles, I am officially obsessed with these vintage sprinkles that I picked up from World Market. I literally want to sprinkle them on every single thing. As you may remember, I’m partnering with Emily from Jelly Toast and Campfire® Marshmallows. We’ve got tons of great recipes from the past couple of years, and more to come next year! 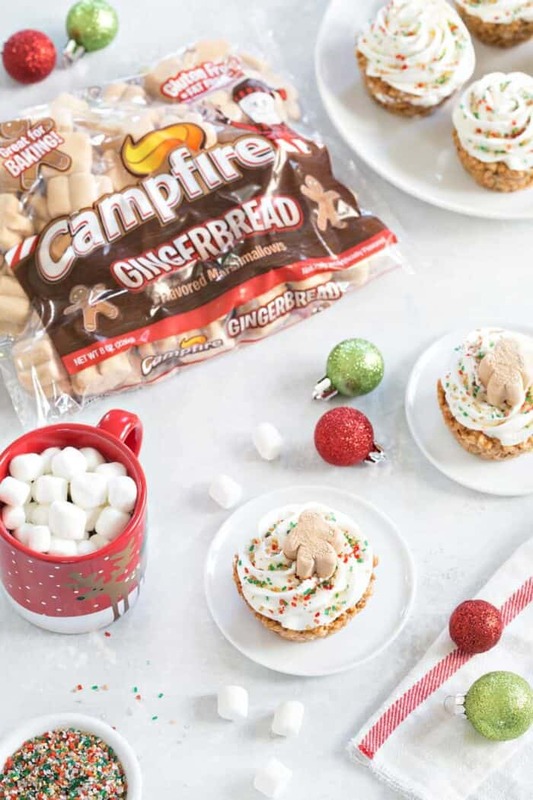 We even created a Marshmallow Madness Pinterest board where we’ve pinned loads of delicious marshmallow recipes for the holidays. Just like these Gingerbread Marshmallow Treat Cupcakes, this Nutella S’mores Fudge and this White Chocolate Peppermint Cocoa. Spray the wells of a 12-cup standard cupcake pan with nonstick cooking spray. In large pan, melt butter over low heat. Add the marshmallows to the pan and stir until completely melted. Gradually add crispy rice cereal; stirring until well coated. Add in sprinkles and stir until just incorporated. Over stirring will cause the sprinkles to release their color into the cereal mixture. Use a buttered spatula or clean, buttered hands to firmly press the mixture into the wells of the prepared pan. You’ll need to work quickly, so the mixture doesn’t set up in the pan. Cool for about 15 minutes. Remove marshmallow treat cupcakes from the pan and prepare the frosting. ﻿In the bowl of a stand mixer fitted with the paddle attachment, or in a large bowl with an electric mixer, beat butter on medium-high speed for about 5 minutes. With the mixer on low speed, slowly add in powdered sugar, and continue beating until well combined. Beat at high speed until frosting is smooth and fluffy; about 4-5 more minutes. If your frosting is too thick, gradually add a little more milk, 1 teaspoon at a time until you reach the desired consistency. Spread or pipe frosting onto cooled marshmallow treat cupcakes and top with colorful sprinkles and gingerbread marshmallows. This buttercream recipe makes enough frosting to liberally frost 12 marshmallow treat cupcakes. If you prefer less frosting, simply cut the frosting recipe in half. P.S. Where did you get your reindeer cup?! Hello! Thanks so much for stopping by! The mug was purchased last year from Crate and Barrel. It looks like they have them this year too, but they are snowmen and on clearance right now for $2.95! Happy Holidays to you and yours! It looks really, really delicious and tasty. Just great for holiday dessert. I totally agree, Cam! Thanks so much for stopping by! Happy Holidays to you and yours!